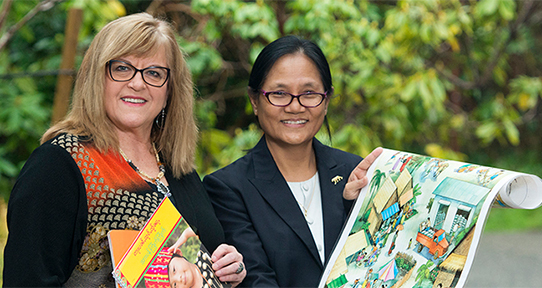 Dr. Jessica Ball (left) with Khin Mar Aung (right), the Director of World Education in Myanmar. Since 2000, Ball and Khin have collaborated on projects to strengthen knowledge and capacity for culturally-based programs that promote children’s healthy development and early education for peace in Myanmar. Photo: UVic Photo Services. Our faculty are internationally recognized academics working to make a difference in the lives of children, youth, families and communities. Learn more about our faculty, adjunct professors and staff. The School of Child and Youth Care at the University of Victoria is a vibrant and diverse academic program that is dedicated to supporting child, youth, family and community wellbeing through relevant, cutting edge research and interdisciplinary scholarship; effective advocacy and leadership; high quality and innovative teaching; a strong and dedicated focus on practice; and a commitment to social justice in local, national and international contexts. We are committed to addressing the most pressing issues facing children, youth and families today, and welcome theoretical frameworks and practice traditions that challenge exclusionary constructions of children, youth, and families. Student learning is a top priority and we place a strong emphasis on supporting Indigenous student success through culturally responsive teaching and support. Reflecting the values of our field, we recognize the importance of creating a culture of learning, mutual respect, and accountability.